Winter brings a sweeping change to mountains and trails with glistening blankets of snow and shimmering sheets of ice. To truly enjoy the beauty of winter without risking ones health, proper gear is mandatory. One piece of winter gear that I can’t live without, is a good pair of crampons or microspikes. For most winter hiking in Southern California, a full mountaineering crampon is overkill. I’ve found microspikes to be the perfect tool for most jobs, as they’re lighter and more flexible. The elastic rubber strap of these microspikes has fit a vast number of hiking shoes. The best fit is on my shoes that offer a semi-rigid last with a solid toe box. A good example is the Salomon XA Pro 3D. On a shoe with a stiff toe and rigid platform, the Hillsound spikes stay put in all conditions. On my shoes with a softer toe box and more flexible outsole (La Sportiva Crossover), the Hillsound spikes can move around a little bit when walking downhill or navigating stretches of talus and scree. It’s not a major problem, but can lead to a little discomfort if not adjusted within a reasonable amount of time. This isn’t a knock on my part, just something to keep in mind if you plan on wearing these on shoes with a flexible sole. The top straps on the Hillsound spikes are very nice. I haven’t used a pair of microspikes without, but it definitely feels like these do a good job of keeping the rubber support from shifting and moving more than necessary. The one thing I’m not so fond of is that the velcro straps are only attached and looped through a metal loop on one side for each foot. As you lace the strap across to the other side, you just run it under the rubber support and Velcro it shut. It would be much nicer if both sides had a metal loop, as this would offer a more precise fit (See “Front” image above). 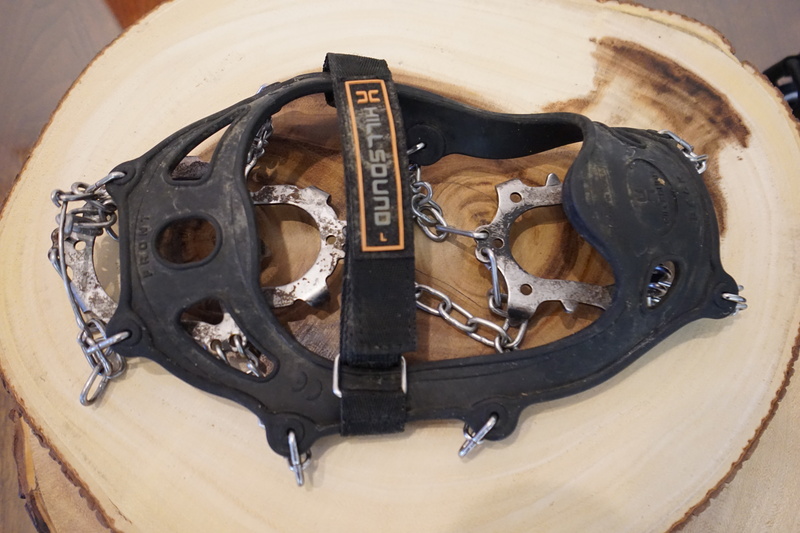 The spike plates on the bottom of the Hillsound Trail Crampons are another reason I chose these over the Kahtoola Microspikes. The solid plate offers great stability and durability. This is also a design that keeps the spikes from moving on your feet. One thing that you’ll notice in deep and wet snow, is these spikes are not the greatest at shedding balling snow. There have been times where I have to stop and clear the balling around the plates to ensure I’ll have traction underneath my feet. A proper crampon would be better suited for these conditions. The 1.6 CM spikes on the Hillsound Trail Crampons have been incredible. I’ve done my best to beat these things into the ground, and they refuse to show any major signs of wear. The 11 points of contact have done a great job to keep me upright on varying trails of ice and snow. I’ve walked over jagged scree and talus, hopped on and over logs, carried heavy loads, and trudged through thick mud. Even after two years of use, I think I should be able to get at least two more. If you’re looking to do a little snow hiking this winter and are in the market for a nice set of microspikes, you can’t go wrong with the Hillsound Trail Crampon. The Kahtoola Microspikes look like a great option as well, but from the research I did, the Hillsound had a slight nod in pure specs. I’m very happy with my purchase, and for just under $60, have gotten more than my money’s worth. – The ergonomic plate system affords stability to the device, keeping the spikes at the outside of the sole and preventing them from shifting during movement. – Perfect for backpacking and winter and shoulder season hiking. – Aggressive traction gives secure footing in the snow and reduces muscular fatigue during your winter wilderness pursuits. – The 1.6 cm spikes dig into ice, glare ice and hard-pack snow with ease. – Elastomer harness is easy to put on and take off, retains pliability to sub-freezing temperatures and fits most footwear. – The rip and stick strap over the top of the foot increases the stability of the device and reduces movement in deeper snow. – Fully tempered stainless steel chains are double linked and designed to withstand torque and friction. They look really great, I’ll have to have a look at getting some. I’ve really enjoyed these as they’ve allowed me to hike year round. Nice. My micro spikes are one of THE best purchases I’ve ever made! Like night and day having the on the icy trails. Me too! It adds so much confidence on the icy trails.